May 20, 2013 AKME-engineering has taken out a license for the construction of nuclear power plants in terms of the execution of works and rendering of services as the operating organization for the construction of the NPP. The license was issued by the Federal Service for Ecological, Technological and Nuclear Supervision. AKME-engineering was established in 2009. Company’s mission is to implement the SVBR-100 project including design, construction and commercial execution of nuclear power plants with 100 MW fast reactors with lead-bismuth coolant (SVBR-100) Generation IV reactor. By 2013 AKME-engineering has been given the status of the operating organization. 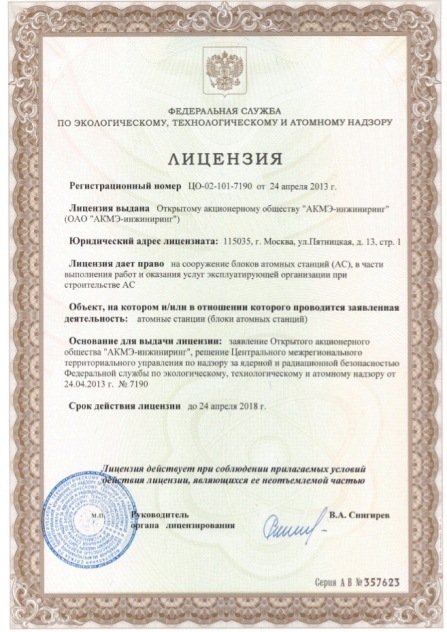 The Company has held a public hearings on the allocation of the pilot SVBR-100 power reactor in Dimitrovgrad (Ulyanovsk region, Russia), has certified the quality management system, has received a positive sanitary-epidemiological decision of the Federal Medical-Biological Agency of Russia and the SRO certificate in terms of admission to the certain types of works that impact the safety of the construction of the pilot unit. The company has also been licensed to carry out works related to the use of information constituting a state secret. As of the present AKME-engineering is included in the list of organizations eligible to possess nuclear materials and facilities, and the SVBR-100 project is being implemented within a framework of the Federal program “New generation nuclear power technologies for the period of 2010-2015 and up to 2020" and is one of the projects of the Committee for economic modernization and innovative development of Russia. – The license enables AKME-engineering to render services to the operating organizations in terms of the construction of nuclear power plants. In fact, the aforementioned document demonstrates a consistent development of the competencies of the company. In future we will have to obtain a license for allocation of the pilot power unit in Dimitrovgrad as well as a certificate of a construction manager for the further construction of the power unit.